Singapore's fast-changing economy is trapping larger numbers of the jobless in a skills gulf. While much of the discussion so far has focused on what individuals should do to adapt and retrain, companies also have a role to play. 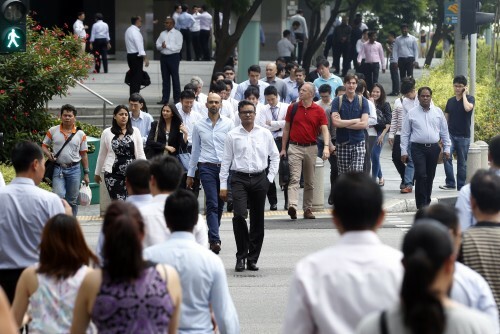 The Monetary Authority of Singapore's (MAS) latest macroeconomic review out on Tuesday painted an especially dire picture of the labour market for professionals, managers, executives and technicians (PMET). These jobs are often more susceptible to business cycle downturns, and many PMETs are finding it tougher to move into new roles because they lack the appropriate skills. The MAS said a combination of slow economic growth and these increasing skill mismatches are weighing on the labour market. Redundancies are on the rise, and laid-off workers are also having a tougher time finding new jobs. The report said the solution lies in part with the workers themselves, who "should equip themselves with the necessary skills to fill the jobs that are currently available and will be in demand in the coming years". This sounds straightforward in theory, but can be much harder to put into practice. There is help available for laid-off workers - including the option to upgrade their skills with SkillsFuture, or programmes which help mid-career workers move to industries with the potential to grow. But it is tough for retrenched PMETs - especially those in the same industry for many years - to segue so effortlessly into a new industry, especially when it might take a while to acquire the necessary skills. Ultimately, businesses also have a part to play in developing programmes that teach the skills they are searching for. This means investing in internships and workplace training to make sure both new and existing workers are brought up to speed. These might be costly in the short run but will help maintain a nimble, more sustainable workforce - and may even help firms lay off fewer staff in tough times.